Here are some SUPER Super Bowl party recipes... appetizers and desserts are my favorite Super Bowl foods and we LOVE easy to eat, finger food recipes for our Super Bowl celebration. Here is a new addition this year from one of our favorite resources for all things yummy.. Messy Little Baker! Stephanie has outdone herself with this SUPER dessert display. Chocolate covered pretzels, a fan favorite and these adorable chocolate covered strawberries she turned into footballs. Visit Messy Little Baker to see how to make them. Along with the sweets, add this easy, festive and healthy Super Bowl party dessert. A football helmet carved out of a watermelon and filled with fresh fruit! Best of all it is so easy to make.. a watermelon, a sharp knife to carve the helmet and bite-sized pieces of your favorite fruits! It is such a festive display that it actually becomes part of your Super Bowl decorations! See how to make this healthy Super Bowl dessert. We have some easy and delicious appetizers courtesy of our expert entertainer Courtney Barnes, founder of the Gourmet Rooster. Gourmet Rooster is an awesome resource for easy recipes and entertaining ideas and has a line of delicious homemade BBQ Sauces and tasty Fruit Spreads. Today Courtney will share some super easy appetizer and dessert recipes, perfect for any Super Bowl party. Sauté sliced onions, in oil, on low heat for about 45 minutes, until onions are caramelized. Chill cooked onions in refrigerator for a few minutes.Mix together sour cream and mayonnaise. Stir in chilled onions and chopped rosemary. Mix well and chill for one hour. So much better than the packaged mix! Mix all ingredients together until thoroughly blended. Set out with crackers. MORE Super Bowl Party Recipes here See how Courtney brings the stadium food concessions right to the party with a Hot Dog Bar!! 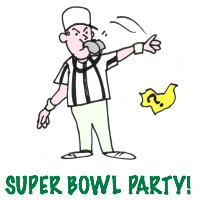 For fun pre-game and half time entertainment at your Super Bowl party check out our Super Bowl Party games page. 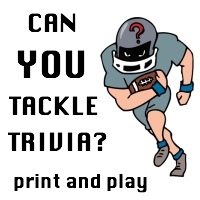 Our Super Bowl Touchdown Challenge trivia game is a proven winner!